So, out of my [Easter] box I have come (sort of) (read THIS for a bit of background). Although my big dreams for Easter at church aren't going to come to fruition this year, there are plans in the works for next year. This year however we will be doing a smaller, modified version of my big dreams and I am so excited for what it will look like! Through a bit of "google research" I came upon 'All Around Easter.' Over the course of two Sunday's (Palm Sunday and Easter Sunday) I'll be taking the children in our children's ministry on a journey through Easter. By experiencing different elements of Easter at various stations hopefully this Easter Sunday kids will leave with a greater understanding and excitement for this holiday. 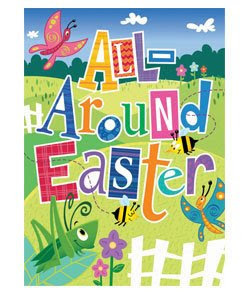 Stay tuned as 'All Around Easter' unfolds! The Why or the What?